for about a year; let me tell you mommies, it was extremely stressful. This time around, I knew I wanted to change things up and offer my baby everything possible. I remember with Ben, we were so much more nervous and careful. I think it was first-time parenting nerves. So, this time around, I quickly (as soon as she had enough teeth) offered Emme little chunks of food as opposed to completely pureed foods, like I had done with Ben years before. And it worked; to this day, she prefers her chunks of food over anything pureed. Which, honestly, is better for them and helps with their digestive system as well as making them more independent and less stressful for you. When Emme went through her picky stage, we tried to stick to healthy options. We would try everything—from fruits to veggies, smoothies, shakes, rice, and soups—until we found what she loved, and then continued adding to her faves. For example, she loves rice, bread, potato soup, waffles, strawberries, and grapes. These are her favorite foods. So what we did was give her these, but also offer a new food with every meal, whether that was a new fruit or new cracker, just to get her to try at least one. Most days were unsuccessful, but others she tried new things and we were all happy. Honestly, I notice she is more of a food-food (like dinner food) person than a snack person (just like me!). She loves rice and beans, meats, pizza, and peas, so, whenever possible, we incorporate her faves while still offering new foods and new flavors. Breakfast is our most difficult meal to this day! So I use the same idea. I offer different foods that she may love and make them appealing, and I can guarantee she will try at least two. For example, I make her oatmeal with strawberries and also a side of bananas, her favorite cereal, and yogurt! I add Go & Grow by Similac® Food Mix-Ins™ to the oatmeal and the yogurt, and I am guaranteed she will not only be full and happy but also get her extra nutrition and healthy benefits with my little secret weapon: the Go & Grow by Similac® Food Mix-Ins™. You can't taste it, but they add a lot of nutritional value to any meal and there are no preservatives and no artificial colors or flavors. Nowadays, she's truly been a lot better. I have never cooked separate meals for my kids; we all eat the same meals, except for breakfast, which is where I make the exception because breakfast is so easy and I don't mind. But when it comes to lunch and dinner, both of my kids eat what we eat. It's worked for us, and that would be one of my tips for you: Give them your food; it will really make things so much easier overall, especially when you are out and about. 1. BENTO BOXES are a great way to let your child experiment and find new foods he or she loves. I used a cupcake baking pan and cut up fruits, crackers, cheese, veggies, and toast. 2. If you must, go ahead and PUREE the foods. I recommend you slowly ease off of this one, but if you’re dealing with an extreme case of picky eating, this will probably save your life! 3. Always, always, always give your baby their VITAMINS. Having a picky eater is difficult; you will worry about their nutrition, and vitamins give you peace of mind. 4. SMOOTHIES! I remember with Ben I would even add boiled eggs to his smoothies so that he could get his protein. Desperate times call for desperate measures. The key to this was to mix the egg with strong flavors – like banana, spinach, and apple – to make it less noticeable. 5. PATIENCE! I promise you, you will get through this. Ben was the pickier eater of the two; his stage lasted nearly a year! I bribed him, I cried, I pureed everything, and some days he would truly eat just toast! Yes, one slice of toast for lunch. It was horrible, but guess what: We got through it and he is as healthy as can be. You just need patience and prayers! 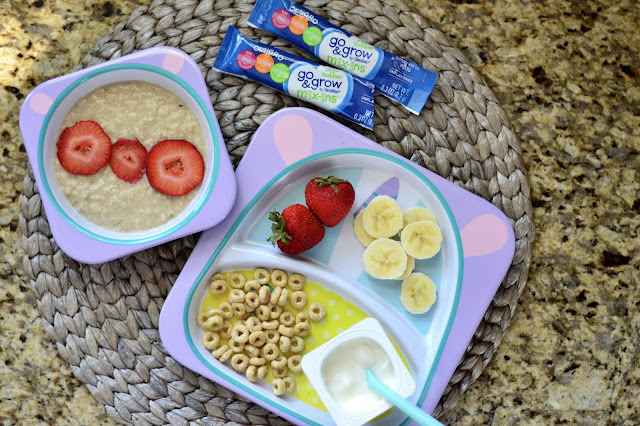 Go & Grow by Similac® Food Mix-Ins™ and Toddler Drinks are secret weapons for adding nutrition to toddler meals!